After reading blogs of Dabrownman, Ian & Khalid in last few months, I was waiting to get my hands on whole spelt flour. Some time back, I found Bob's Red Mill's whole spelt flour in a supermarket and jumped to buy it. As it is not cheap, I wanted to make sure that every bread made from it was worth the price. So the flour had been lying in my freezer for quite some time now. Finally in the last week, I managed to make 3 breads from the whole spelt flour. 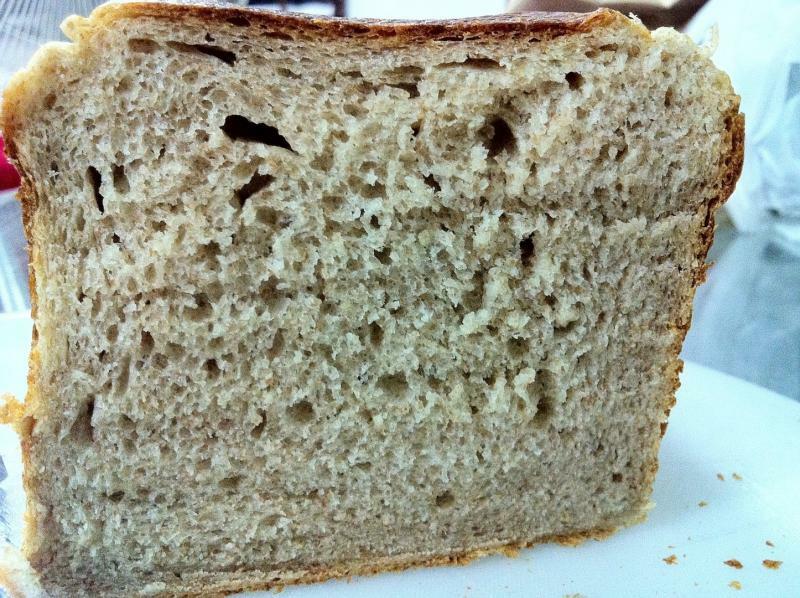 First one I tried was Hamelman's Honey Spelt Bread, with Pate Fermentee. It has 75% whole spelt flour. The changes I made from original formula were using agave nectar instead of honey and making pate fermentee with RYW instead of instant yeast. I don't really bother about results while making Hamelman's breads as there is hardly any chance of bad outcome. This one also remained true to form. A perfect bread to intoduce my household to whole spelt. 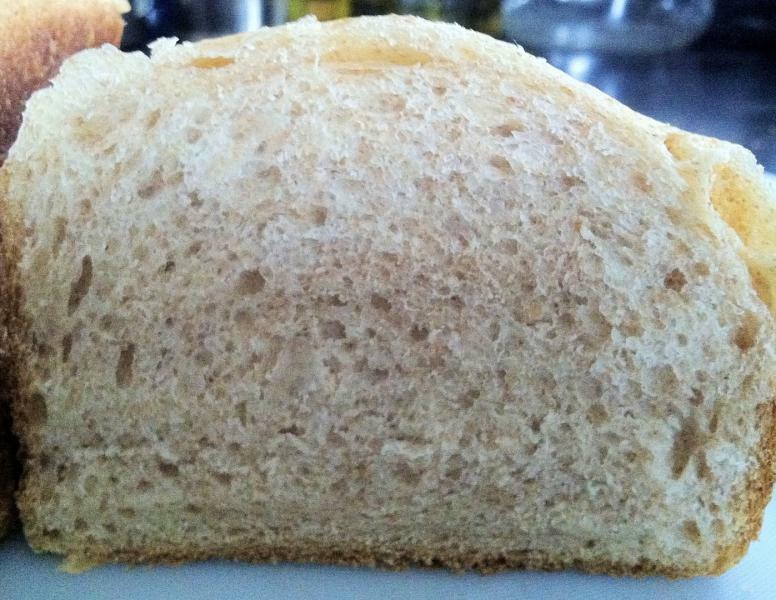 Light, airy & tasty, the bread gave all the flavour of wholegrain flour, without the denseness. Here are the crust & crumb. 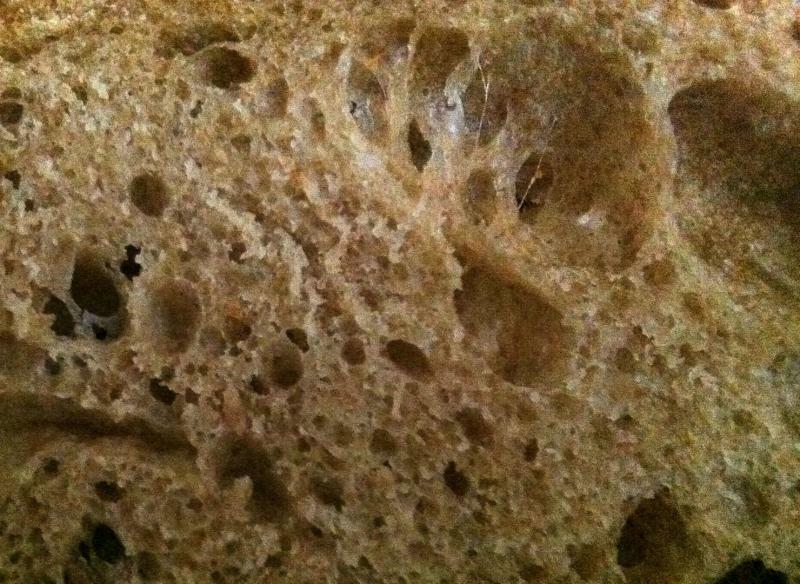 The crumb shot is grainy, but it still shows the character of the bread. Now that I knew we all liked spelt, the next step was to make it part of my children's daily bread. So once again I turned to Hamelman and the bread much loved by my kids - Pain De Mei. Changes I made to the PDM - Used 60% whole spelt flour & 40% bread flour, made tangzhong with 8% flour (used bread flour) and used levain made from my SD & RYW instead of instant yeast. Hydration had also to be increased from 60% to 68% to get the right dough consistency. My son ate half of this bread without anything on it. So another winner on hand. This is thelast slice after 4 days. I hid it to see how long it stays soft. Still pretty soft, with an added slight (pleasant) tang from sourdough. 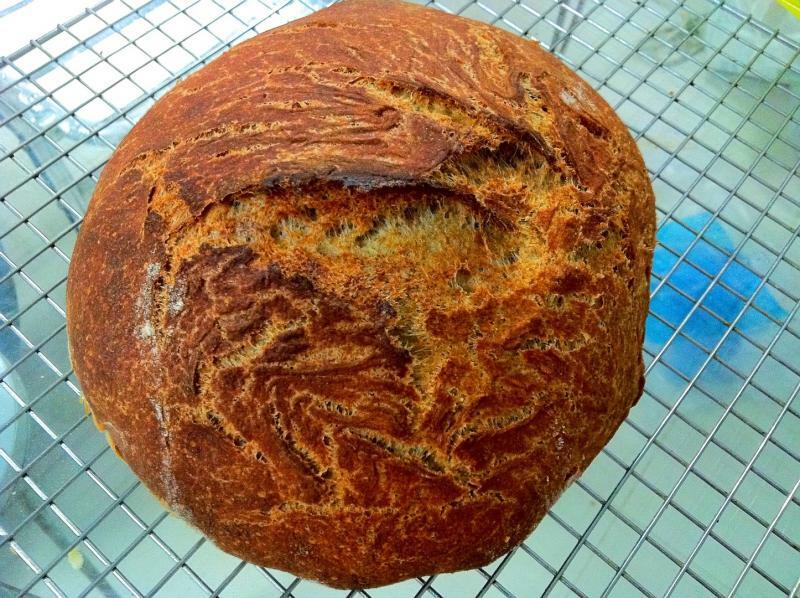 After 2 very nice results from spelt, I was contemplating the next one yesterday, when I read Floyd's post about Ken Forkish's FWSY winning the James Beard Award. 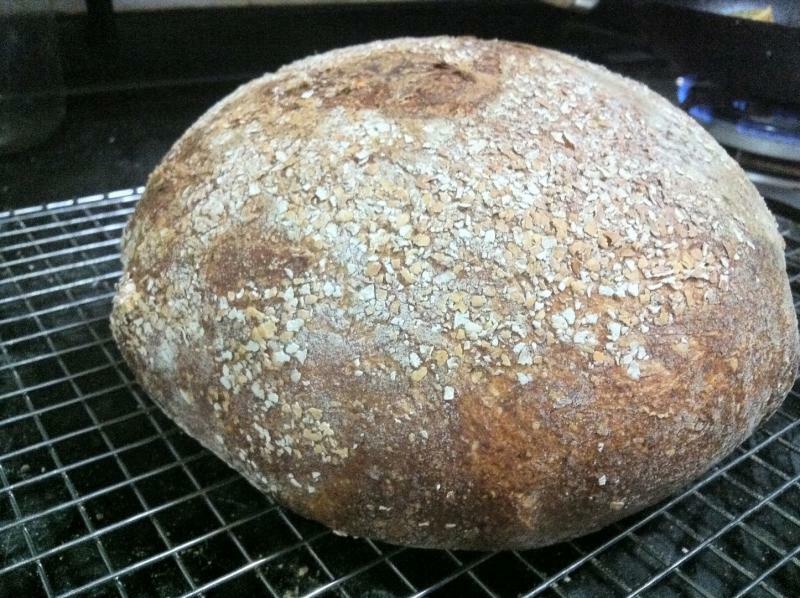 My choice was obvious - Harvest bread with poolish. This one uses minimum whole spelt (10%), but it still comes through. I changed whole wheat flour to whole spelt flour and used Apple Yeast Water levain instead of poolish & skipped instant yeast in final dough. I also toasted the wheat germ (5%) and oat bran (2.5%) , thanks to dabrownman's toadies. It came out of my claypot DO with a great oven spring and have just cut one slice to taste and for crumb shot. A bite of this bread is a testimony to the well deserved award! Wow! That's some impressive collection of breads. I love your creative adaptations and your results look tasty and beautiful. I blame the "exotic flour" bug on you. Next one is going to be Kamut & Amarnath. But limited space in fridge and the exorbitant price tag means I will try one at a time. Thanks so much for all the inspiration and encouragement. I appreciate it a lot. Glad I could help inspire you. I just took my latest bread out of the oven. Hopefully it will taste as good as it smells. It's so much fun to experiment with new and different flours and combine them for different flavor profiles. look forward to your next bake. long your going to spelt now, after all of these years, just shocked me to no end! I love whole spelt, no question about it. Mixed in equal amounts with WW and rye and you have the making of a fine Multi grain SD ./ YW bread. Also, don't tell anyone.... Toadies are terrific don't you think? And the double T with Tang Zhong will knock any bread off its stone! That is some kind of happy baking for a Toady. I am really grateful for all the help and support that I get from you and others on this forum. I have learnt so much from your sensational bakes, many of which I have to yet put in practice. Your toadies really rock. Now on I will try to put them wherever I can. I am sorry if I gave any impression of having baked bread for many years. Actually, next week will mark six months of my bread baking. I did make one challah in 2006, when I first found TFL, but that was just one off. I have been baking cakes, cookies and other desserts for some years now and after one attempt at Challah, which turned pretty fine but was too much hassle, I forgot bread and TFL and went back to the sweet stuff. Over the years, I have been trying to convince my husband to buy me a bread machine, but that was more because I am a gadget freak rather than for bread per se. Appliances keep me going to kitchen. My husband was of strict opinion that BM is waste of space and money and hand kneading or mixer is better deal. But then my hubby is a hands-on DIY person and I live in world of numbers and theories. Finally he relented and I got my BM last October. I have been really lucky as right from the first bread I made, the result was a perfect loaf (as much as BM can make) which was very tasty. To be honest, being a geek & bookworm by nature, I read and studied masters like Hamelman, Reinhart, Calvel, Bertinet & Suas six months before I bought the machine. 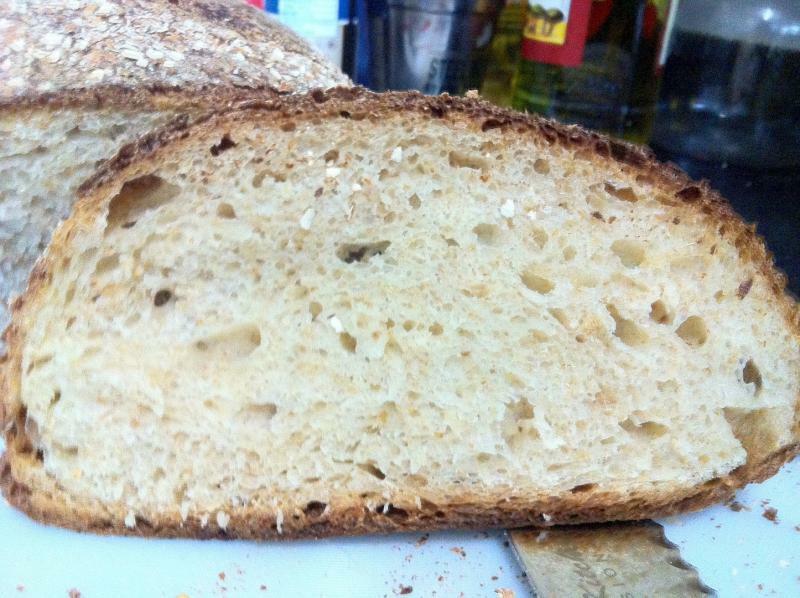 In December I started making no knead bread and it also worked well. Then I remembered TFL and returned to it again somewhere in the beginning of this year. And am I having a gala time or what! Now I mostly use my BM for intensive kneading and to make sandwich loaf when I have less time. My hubby does say "I told you" sometime, but I think the BM was the one that started me on this journey, so I am thankful to it. It also thrills me when I make a sourdough or multigrain bread in my BM by adjusting schedules manually and it turns out well. And it makes perfect jams :). I do hope to keep learning from all of you and making good bread for my family & friends. I guess today is the D-day for you and your family. Have a great time. Waiting to read the account of the graduation ceremony. you were a TFL member since 2006 that you had baked every bread there is to bake, except for some of Ian's! So now you have so many to try out - lucky you - years of exploration. I've probably baked 150 different breads in the last 16 months so only 1,000 more to go before slim pickings arrive:-) After that, my apprentice has all of the Fresh Loafing formulas to bake. What fun the bread tastes good too. I don't do much kneading but if they come out with a BM that does slap and folds - I'm a buyer. It's good to know that they make good jam and automating that process would be nice and maybe yogurt too! Strawberry jam I made in BM for a friend. Waiting to see your new creation. Sounds yummy! Beautiful breads! Your bakes make me want to play with other grains. I have some spelt berries that I have been wondering what to do with and all of your breads have given me ideas - thanks! and I love the taste of spelt. Just being in Germany I walked full of envy through the nearby Bio market where they had not only spelt berries, rolled spelt, whole spelt flour, but also lighter spelt flour types 630 and 1050. Not to mention all the other ancient grain berries and flours. But check-in luggage is costly, and I will take only one little bag of medium wheat Typ 1050. SIGH! Thanks, Karin. Spelt was truly loved by my household. If I had to name the most important thing I learnt from TFL, it would be use of alternate flours & grains. Till I returned to TFL, I was learning through books and I would go over the flour sections just for info. I didn't think about going around searching for flours. Now that is the first thing I do in a grocery store. Do you use the 1050 flour you picked up for pizzas & baguettes or is it for pastry? I am going to trouble you for addresses of shops next time my husband visits Germany, though it will take quite some effort on my part to convince him as he is most reluctant to carry any more luggage than bare essential :). This flour is used in many German breads for a lighter whole grain addition, often together with other whole grain flours like rye or spelt. I managed to bring 1 package back, but for the lighter spelt flour Typ 630 wasn't enough room in my suitcase. I'm happy to give you any information I can, when your husband leaves for his next trip to Germany. Whole Spelt flour put to good use, i say. Nice bakes Alpana! So, Hamelman's new book contains recipes for spelt? Nice! I'm amazed at the unique color imparted by the spelt (orange/reddish hue). you are baking with excellent results, Alpana. Yes, he has added a Spelt recipe as KAF Bakery developed one "responding to customer requests". Customers are smart :). I was not sure what to expect from spelt but had confidence in all of your tastes. Thanks for your encouragement for baking. So much more exciting world still to explore.